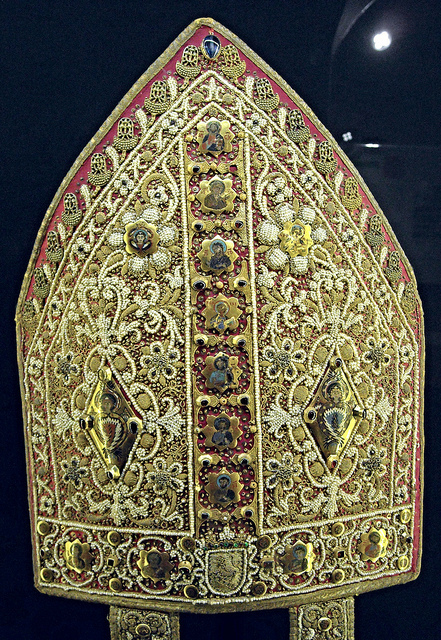 Silk, pearls, and silver-gilt motifs; the scene on the reverse is the Virgin Enthroned. 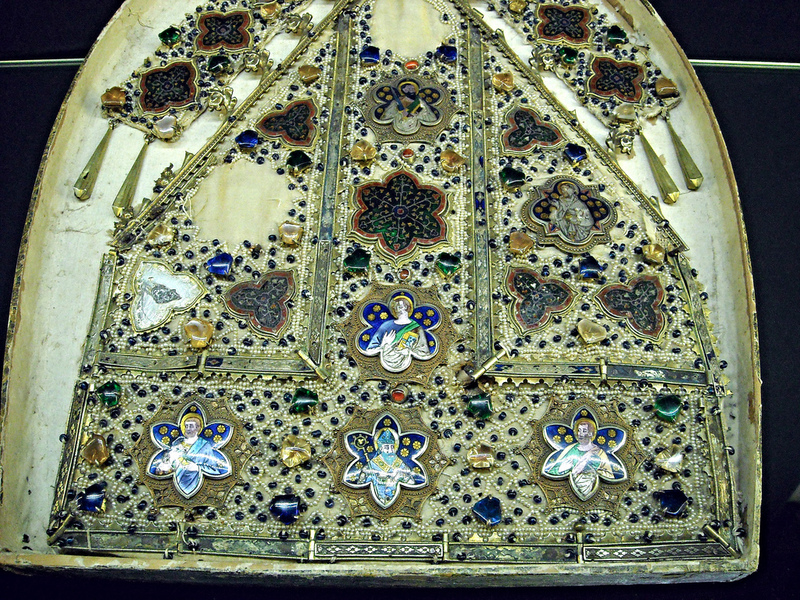 Elaborate medieval embroideries were often further enhanced by the addition of pearls and other precious and semi-precious stones, gold or silver ornaments, enameled plaques or, very occasionally at this period, glass beads or discs, whilst some are almost exclusively composed of these ornaments and might not properly be considered as embroideries. 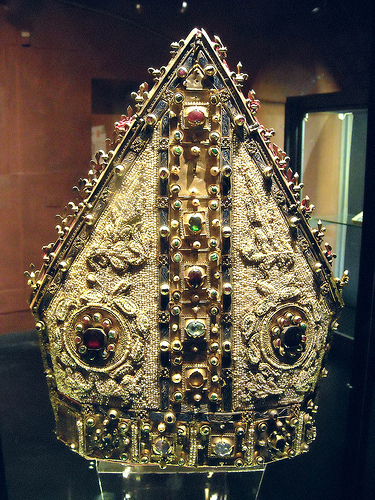 These powerful symbols of class and wealth were at least as widely seen in the church as in royal or aristocratic courts: many of these rich creations were the gift of wealthy patrons seeking influence or favors. However, it would eventually be this very enrichment which ensured the destruction of these pieces, for once the gold, jewels, and pearls were removed, the ground would quickly be recycled. So much of this work has disappeared that it can now be difficult to envisage the extravagance involved, though the imagination is aided by fifteenth-century paintings which, with their naturalistic and precise approach, frequently portray these jewel-enriched garments. Coupled with the boldly designed and colored Italian silks and velvets the effect must indeed have been sumptuous and impressive. Pearls were very popular in the Middle Ages, especially tiny seed pearls, which were much used in place of jewels in crowns, or to form haloes, birds, masks, or other decorative motifs. English royal accounts of the fourteenth century reveal that these pearls cost between £1 and £2 per ounce. Together with a range of other, larger pearls, some colored, originating from the East or from Scotland, they were frequently employed upon festal or jousting garments at the French and English courts and often massed together to form decorative motifs. In 1345-9, for example, Edward III’s armourer John de Cologne made five hoods of white cloth for the King and his friends, each worked with blue dancing men and fastening at the front with buttons of large pearls. 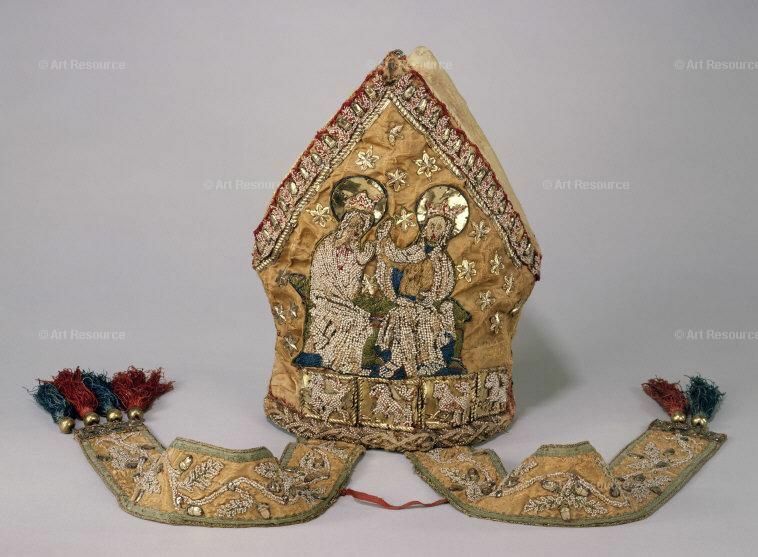 They required 2350 large pearls, together with velvet, silk and gold thread. These richly embroidered hoods were fashionable at the time and there are many entries listing the expensive requirements for them. 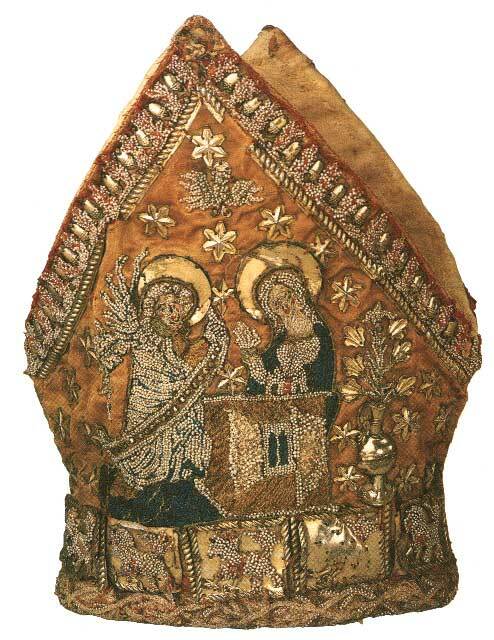 The mitre from Minden, a rare and almost complete survival from the Middle Ages, shows the technique used in an ecclesiastical context, combined with plaques and golden ornaments, whilst the single mask and few acorns of pearls still in place on the Butler-Bowden cope show something of the original richness of the embroideries. The incorporation of gold ornaments similarly enlivened the decoration, catching the light and adding an impressive three-dimensional quality. The ornaments, as with pearls, could simply be assembled and sewn into place and did not therefore demand the services of skilled embroiderers. Rather, they involved goldsmiths to create them in specially carved moulds, drawing these craftsmen into the large embroidery workshops. Also catching the light in embroideries were “doublets” — tiny discs of glass of a type still seen in Indian embroideries — which appear to have come from Venice. Countless similar examples are described in both the English and French royal accounts of the fourteenth century, none of which, sadly, have survived. For the Christmas and New Year festivities in 1393-4, two gloriously extravagant and light-hearted concoctions of this kind were created for Richard II: a white satin doublet embroidered in gold with orange trees on which hung one hundred silver-gilt oranges, and a “hancelyn” (believed to be a loose outer garment), also of white satin which was embroidered with leeches, water and rocks, and amongst which were placed fifteen silver-gilt mussels and fifteen silver-gilt whelks. How these must all have sparkled in the subdued lighting of the medieval royal halls. Late medieval taste was particularly attracted to light-reflecting ornaments on clothing and horse-harness where movement would produce a multitude of glinting reflections. 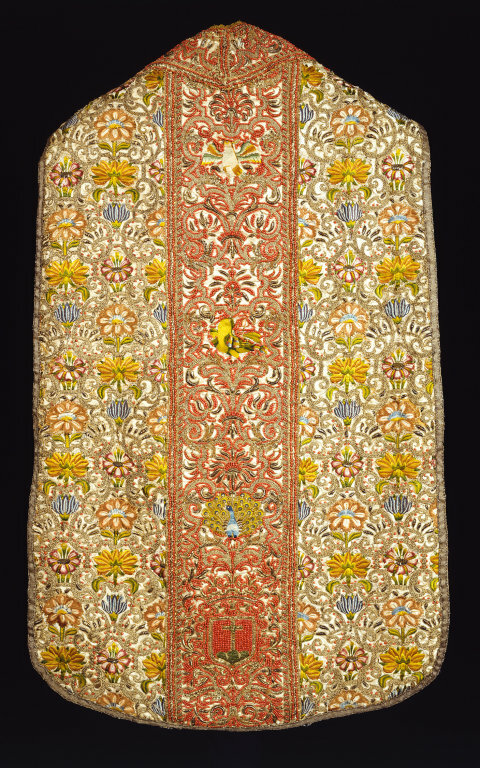 Consequently gold and silver motifs of all shapes and sizes were incorporated into embroidery. In 1441 the Goldsmiths Company confirmed and renewed their Ordinance for Making Spangles which fixed prices. These “spangles” were the equivalent of modern sequins, mall, round, thin pieces of glittering metal with a hole in the centre to admit a thread; some were rectangular in shape and sewn at one end only, whilst ohers survive in situ on embroideries but a number have turned up in archaeological contexts, perhaps the small lost hoards of people in flight from invaders. 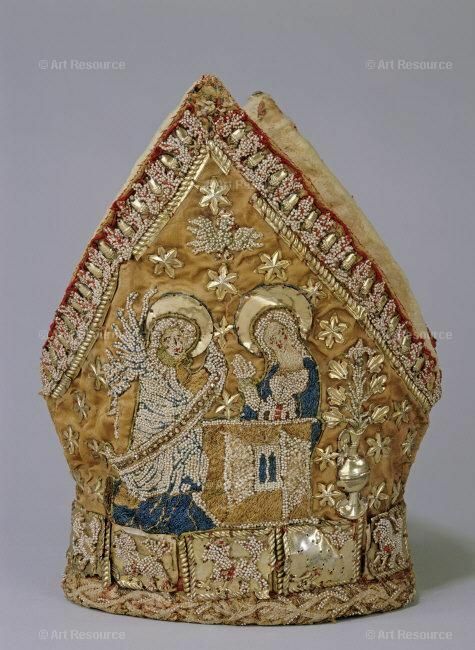 This entry was posted in 15th Century, Period Beadwork, Vestments and tagged 15th, church, extant, mitre, seed pearls, vestments. Bookmark the permalink.